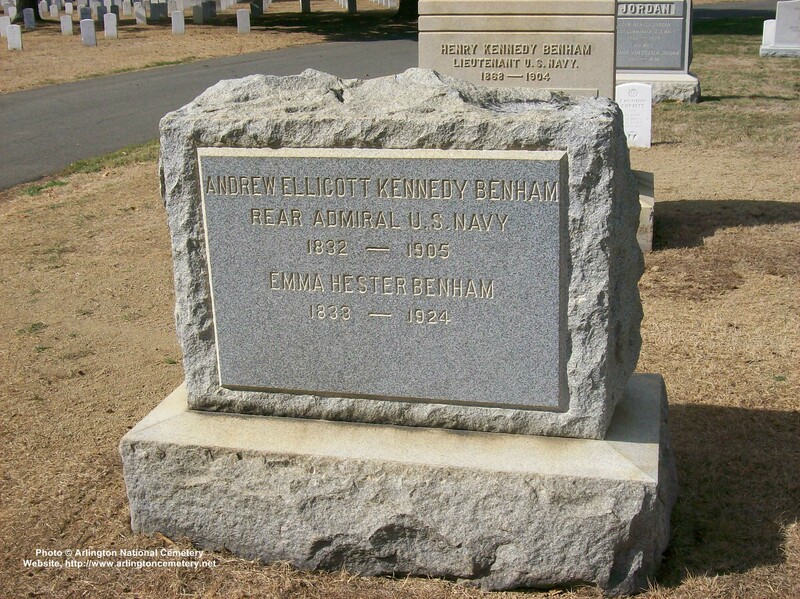 WASHINGTON, August 11, 1905 – The death of Rear Admiral Andrew E. K. Benham, retired, at Lake Mahopac, New York, was reported to the Navy Department today. Rear Admiral Andrew E. K. Benham became the center of public notice by his summary action in behalf of American vessels in Rio Janeiro in 1891, and in 1901 sat as a member of the board that tried Rear Admiral Schley for his conduct at the battle of Santiago during the Spanish-American War. Up to the breaking our of the revolution intended to replace the deposed emperor, Dom Pedro, at the head of the government in Brazil, Rear Admiral Benham was only known as an efficient officer of the United States Navy, who had earned his rank b his bravery during the Civil War and his excellent work both in the Naval Schools and at sea in the time of peace that followed it. In the usual course of naval changes he found himself in command of the South Atlantic Squadron when the revolution against the recently formed Republic of Brazil began. Three American vessels desired to dock in the harbor of Rio Janeiro, but Admiral De Game of the insurgent navy refused to permit them. Admiral Benham, on January 27, gave notice that the American vessels would proceed on the next day to the piers.. Da Gama responded that it they attempted to do so they would be fired on and sunk. To this Benham’s answer was that they would be protected by his vessels. The communications between the two Admirals consumed the time of January 27 and 28, and on January 29, in the morning, the American vessels took up anchor and set sail for the piers. Five of the insurgent fleet had taken positions near the vessels and Rear Admiral Benham’s flagship, the Detroit, with guns shotted and the gunners in position to fire, ranged in between the American and insurgent vessels. The Brazilian ships’ crews were at their shotted guns and both sides tensely waited the other to fire, when from someone on whom the strain had told there came a single musket shot. It only increased the tensity for a few minutes, for the Brazilians weakened and allowed the American ships to reach the piers and the affair was over with one shot. Benham received great praise for his action and some blame. 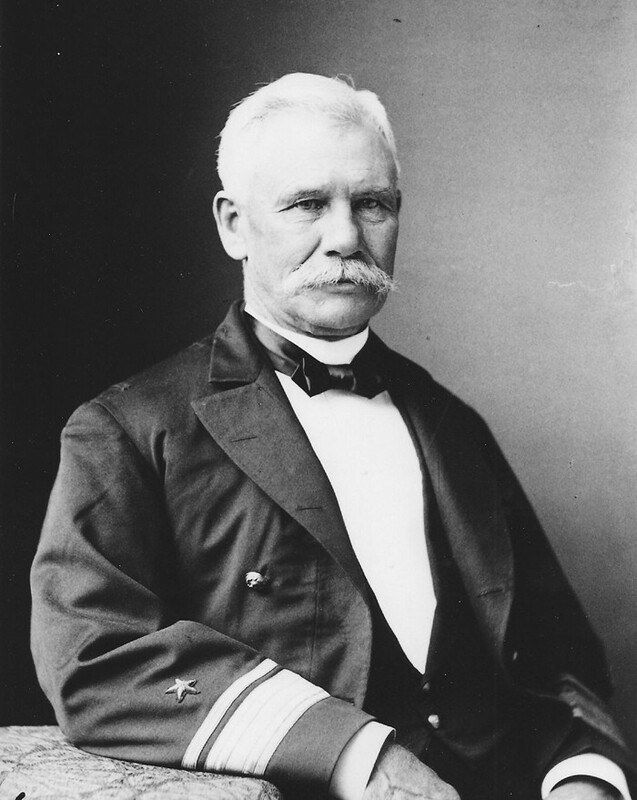 Rear Admiral Benham was born in New York on April 10, 1832 and appointed a Midshipman from there in 1847, and served a term of five years apprenticeship at sea before going to the Naval Academy. On January 10, 1853 he was appointed a passed Midshipman, and was sent to the Pacific, where he served on the St. Mary. He was commissioned Lieutenant on September 16, 1855, and spent a year in the Coast Survey. In 1857 he was transferred to the Atlantic and served in the Brazil Squadron and took part in the Paraguayan Expedition in 1858-59. His first active Civil War duty was done at Port Royal on the Bienville. In 1862, January 10, he was made Lieutenant Commander and went to the gunboat Penobscot and served on her during the rest of the war. He was made Captain in 1875, Commodore in 1885 and Rear Admiral in April 1890. He was retired for age in April 1894. NOTE: His son, Henry Kennedy Benham, Lieutenant, United States Navy, died of appendicitis in 1904 while on active duty at Key West, Florida. Posted: 23 October 2007 Updated: 16 February 2010 .